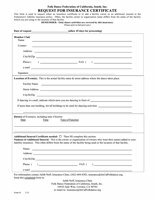 Dance Insurance - Folk Dance Federation of California, South, Inc.
Keep an Attendance Log (available under "Publications") at each meeting or class. Everyone present must sign in. These logs must be retained for five years by each Member Club. The insurance company reserves the right the examine the logs. The Member Club shall maintain a membership roster as defined by its Constitution, Bylaws, or Standing Rules. If a Member Club has no specific membership definition, a Membership Roster (available under "Publications" in the "Package") of all those who participate in the Club activities at the time of application or renewal must be compiled from the Club's attendance logs. The membership roster must include names of all members. All members of the Club must be covered by insurance. The Member Club, however, is not required to insure any of its members whose insurance premium will be paid by another Member Club in the Federation. On the membership roster that your Club submits as part of its membership packet, identify any member who will be insured by another Federation Member Club, anb in each case, state the name of that Club. Submit your membership package, including the insurance premium, completed Club Membership or Renewal, Club Information, Membership Roster, Request for Insurance Certificate, and Folk Dance Teachers forms (all available under "Publications" in the "Package") to the Director of Membership who will distribute forms accordingly. If an Additional Insured Certificate is required by your facility, the Request for Insurance Certificate (available under "Publications" in the "Package") must be completed and included in the membership packet. Any Club that elects not to obtain the required insurance through the Federation must provide the Federation with evidence in writing proving that the Club has insurance coverage from another source that meets Federation requirements. When no insurance certificate is required for a special event, complete the form titled Notification of Special Event (available under "Publications") and send it to the Federation Insurance Chair (do not contact the insurance company directly). If any problems are encountered when inspecting a facility where Federation Club dances are being held, give a copy of the suggested form titled Inspection of Facilities for Conditions of Safe Use (available under "Publications") to the representative of the facility. Otherwise, the Club later could be billed for repairs or cleaning, or held liable, if the condition of the facility is inadequate for dancing and an accidental injury is sustained by a dancer as a result of faulty conditions. Anything found not in proper working order should be noted and brought to the attention of the representative of the facility (custodian) before taking possession of the facility. Items to be noted could be, but are not limited to, sticky floors, loose tiles, loose floor boards, and lighting problems. In the event that any person is injured while participating in dance activities at a Federation Club or event, the Club (or Federation) president or designated Club officer shall file a completed the form titled Club Accident Report (available under "Publications") of the accident, specifying the cause (if known), the person or persons injured, and a description of what happened. This report shall include the names and addresses of witnesses and any other pertinent information. This report must be filed with the Federation Insurance Chair (do not contact the insurance company directly) within 48 hours following the occurrence. The Insurance Chair will, upon receipt of the injury report, send the Club a medical claim form to be completed by the injured person. The claimant should personally mail or deliver the completed form to his or her Club president. The Club president will sign and forward the form to the Federation Insurance Chair (do not contact the insurance company directly), who in turn will submit the form to the Insurance Company. A claim received without bills will be held on file by the Insurance Company until bills are submitted. If treatment is to continue over a long period of time, the bills are to be sent as they are received by the claimant. The Club Accident Report form (available under "Publications") is intended to assist you in reporting the occurrence. It is not intended to be used for filing a claim for medical payments. Whenever new people join a Federation Member Club, the Club must report those members to the Federation and submit a currently pre-determined fee for each new member. To submit new member names, complete the New Club Member form (available under "Publications") request for insurance and send it to the Federation Treasurer. Questions regarding insurance should be directed to the Federation Insurance Chair (do not contact the insurance company directly).